The fundraising reports for the third quarter have mostly trickled out, giving insight to donors and pundits into how candidates in some of the top races are faring nearly a year out from Election Day. Van Hollen continues to set pace: As the two face off for the highly contested Democratic primary to replace the retiring Sen. Barbara A. Mikulski, Rep. Chris Van Hollen widened his fundraising lead over Rep. Donna Edwards. Just six months before the primary, Edwards raised $638,520 in the third quarter, less than the $950,000 raised by Van Hollen. He also maintains a cash advantage – $4.1 million compared to Edwards&apos; $368,500, according to the two campaigns. In the wings, Rep. Elijah E. Cummings – a Democrat who has sent mixed messages about a possible run, but also who a Washington Post poll found would enter the race well ahead of the other two leading Democrats – raised just $135,992 in the third quarter for his House re-election campaign ending with just shy of $981,000 in the bank. Duckworth flexes some muscle: In states like Illinois, Ohio and Florida, Democrats with support from the Democratic Senatorial Campaign Committee fared much better than their anti-establishment foes. Democratic Rep. Tammy Duckworth flashed her fundraising strength over both Republican Sen. Mark S. Kirk and Democratic primary rival Andrea Zopp. 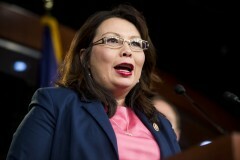 Duckworth raised $1.46 million over the last three months, ending the quarter with $2.8 million in the bank. But despite her quarter , Kirk still has more in the bank. He ended the quarter with $3.6 million on hand after raising $1.05 million between July and the end of September. Zopp, the former president of the Chicago Urban League, who has complained about the lack of establishment support for her campaign by fellow Democrats, raised $425,000 in the same time period – far less than her $671,000 haul in just six weeks last quarter – and claimed just over $816,000 in the bank. Off the pace: Former Ohio Gov. Ted Strickland, a Democrat also endorsed by the DSCC, is going to have to pick up the pace to raise the $20 million his advisers had identified as what he would have to raise by November 2016 to beat incumbent Republican Sen. Rob Portman. In the third quarter, Strickland raised almost $971,000, bringing his total raised so far to $2.7 million. P.G. Sittenfeld, a Democrat challenging Strickland in the primary, raised far less – adding $229,000 to his campaign and ending the quarter with about $784,000 on hand. Portman added $2 million to his account and ended his quarter with $11 million on hand for re-election. 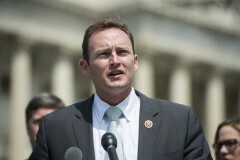 Democrats battling in two tossup states: In the race to replace outgoing Florida Sen. Marco Rubio, the DSCC&apos;s candidate, Rep. Patrick Murphy, is the third quarter&apos;s clear winner. He raised $1.5 million and ended the quarter with $3.5 million in the bank. Rep. Alan Grayson, who is running against Murphy for the Democratic nomination, raised about half of that – pulling in $743,000 and ending the quarter with only $252,400 in the bank. But Grayson is expected to use some of his personal wealth to help fund his campaign. On the Republican side, Rep. David Jolly – who just transferred nearly $378,000 from his House campaign – was out-raised by Ron DeSantis . In the heated Pennsylvania Democratic primary to take on Republican Sen. Pat Toomey next year, Katie McGinty raised $1 million since launching her campaign in August. She filed her report just a few days after being endorsed by the state&apos;s governor, Tom Wolf. Former Rep. Joe Sestak, the other top Democrat, has not yet announced his fundraising total. Braddock Mayor John Fetterman raised only $170,000 after launching his campaign midway through September. Meanwhile, Toomey raised $2 million in the third quarter. As he prepares to defend his seat which Democrats plan to target next year, he is armed with $8.6 million in the bank. Wisconsin candidates essentially even: In Wisconsin’s tossup Senate race, former Democratic Sen. Russ Feingold raised about $1 million more than GOP Sen. Ron Johnson. But the two are nearly tied in the long-term cash race. Johnson ended the quarter with about $3.5 million on hand compared to Feingold’s $3.4 million. This quarter, Johnson’s fundraising slipped significantly. Between April and the end of June, he raised over $2 million, compared to about $1.4 million between July and the end of September. Feingold, on the other hand, bested his $2.3 million third quarter by about $100,000 this quarter. 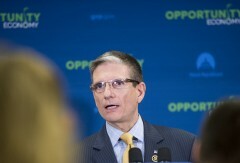 Honorable mention: In Nevada , the third state rated a Tossup by the Rothenberg & Gonzales Political Report /Roll Call, Republican Rep. Joe Heck – the Republican hoping to replace retiring Sen. Harry Reid next November – reported $2.76 million in the third quarter. His Democratic opponent, Catherine Cortez Masto, raised about $1.4 million. Underdogs fared nicely: As he mounts his challenge to Republican Sen. Roy Blunt, Missouri Secretary of State Jason Kander posted his best fundraising quarter yet since launching his campaign this spring. Kander, a Democrat, raised $825,000, according to his campaign, ending September with $1.6 million in the bank. But Blunt, a member of Republican leadership with deep ties in Washington, continued to outpace his younger rival. Blunt raised $1.27 million in the same time period and ended with $4.4 million in the bank. McCain piling up money: Arizona Sen. John McCain nearly doubled both his primary and possible general election rivals, raising $1 million and ending September with $4.9 million for his re-election campaign. But, his two opponents posted respectable quarters in their own right. State Sen. Kelli Ward, the Republican challenging McCain in the primary, raised just over $525,000 but ended with $320,000 in the bank. Rep. Ann Kirkpatrick, his Democratic rival, raised $570,000 and ended the quarter with $776,000, according to her campaign. Simone Pathé contributed to this report. Correction 10:29 a.m. A previous version of this article misstated the current governor of Pennsylvania. It is Tom Wolf.